In alternative fashion media, stronger opinions are expressed, yet they recognise the opinion of others as well. Diversity is regarded as an asset and uncomfortable conversations deemed essential for progress. Traditional publications have noticed the shift and are slowly adopting some of the changes pioneered by alternative media by creating their own additional channels such as British Vogue ’s multiple youth-oriented Youtube series and ELLE’s ‘Fashion for All’ inclusive video campaign. They make an effort to react to criticism concerning the propagation of a single body type or ethnicity by including more diverse models. However, these adjustments sometimes appear inauthentic as they seem to fit into the traditional framework as something to be ticked off. – Syntax/144 by researcher, academic and activist Otto von Busch is ‘a method for a radical democratic fashion magazine’. 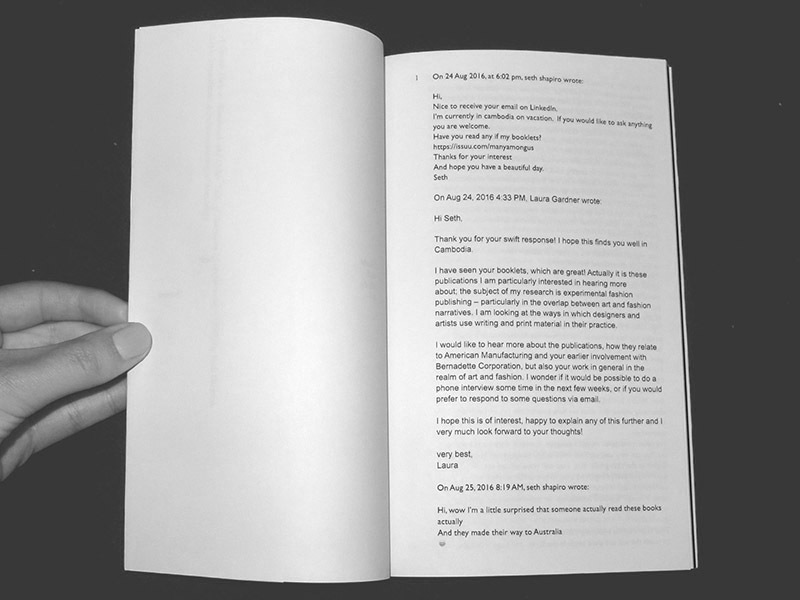 This open-source (or ‘copy-left’) zine can be curated by anyone by following instructions on his website Selfpassage . Meant to be a ‘channel for free speech and visual multitudes’, it seeks to dismantle traditional fashion publications’ hierarchical structures and to help to promote local talent as well as expressions of fashion that would not usually be picked up by mainstream fashion media. However, instead of opposing the latter, von Busch sees the publication as a complement to them. Syntax/144 extends content to include what was missing. 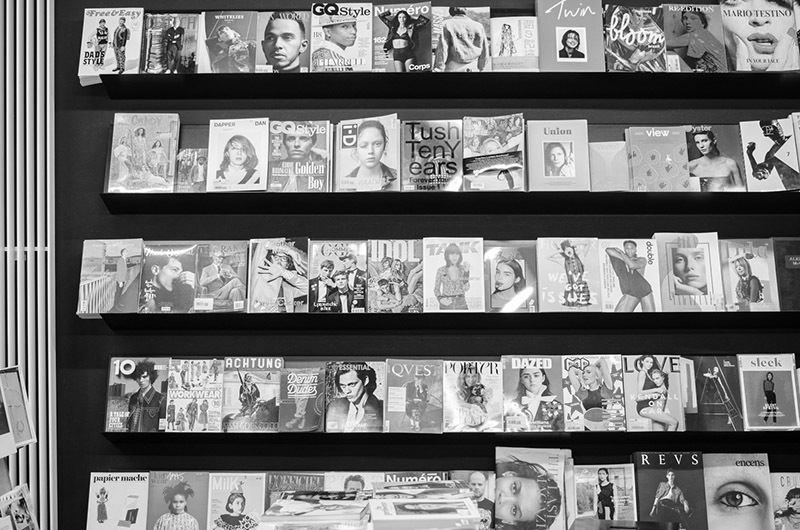 In line with this, von Busch proposes an alternative method of distribution as well: copies of syntax/144 should be placed ‘inside other magazines in local shops, boutiques or libraries’ to be discovered by chance. 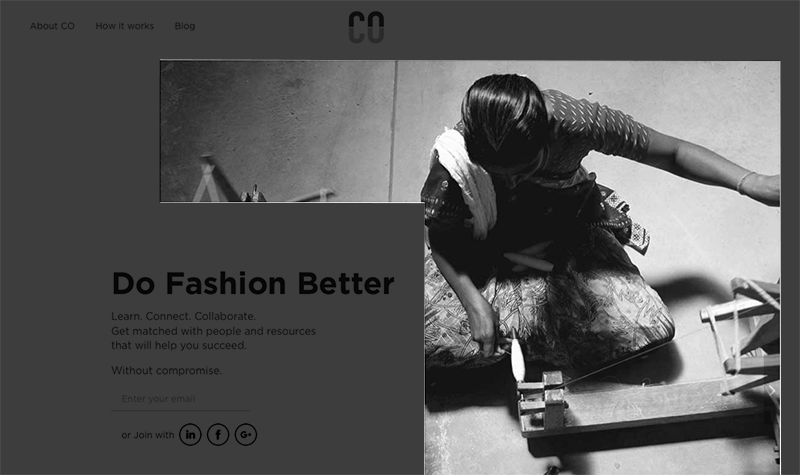 – Common Objective (initially named Mysource) is a platform launched by Ethical Fashion Forum in 2017 that uses matchmaking technology to connect sustainable fashion businesses and those interested in becoming more sustainable with fitting suppliers. In addition to making networking easier, it educates users about sustainable developments in the industry, shares success stories and provides resources to guide them. Current sustainable practice is not mandatory to join the platform, but it is rewarded with more visibility and buyer connections. This tactic is used to reach a wider audience beyond those already involved and to create ‘a level playing field, in which sustainability becomes an opportunity, rather than a cost’. The platform aims to educate and help create successful businesses that make better choices for the people working for them and for the environment. It goes beyond sharing information and facilitates real-life cooperation. 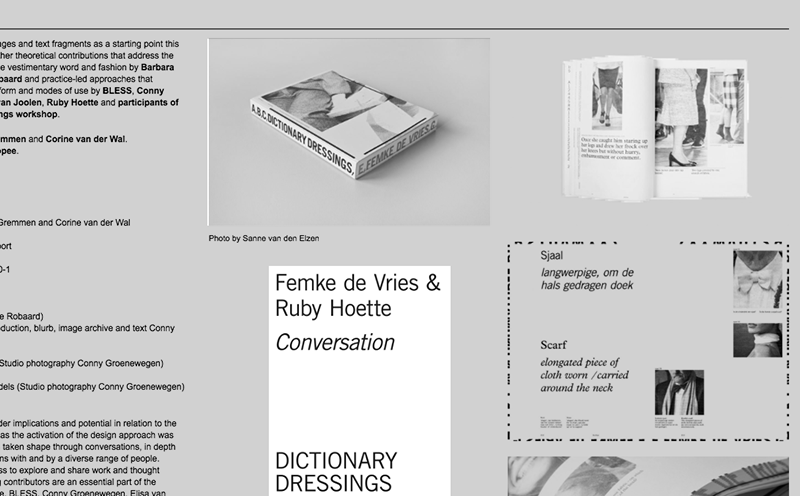 – Dictionary Dressings is an ongoing research project by Femke de Vries that takes rational descriptions of garments as they are found in dictionaries and then illustrates them through non-fashion-related imagery, text and objects. The discrepancy between rational definitions and fashion’s style influence on these body coverings become obvious and new clothing categories emerge. Traditional styles are questioned and garments’ re-readings open up a new experimental approach to design that draws directly from theory while questioning assumptions we might have about clothing. The project is a multidimensional exploration of fashion that expresses itself through various media, including exhibitions that bridge the gap between theory and practice as well as between making and writing about fashion. Collected fragments around clothing terms grow into an ever-changing interactive archive that aims to expand, instead of restrict, what is possible in fashion. – Alternative fashion media make use of the spoken word to tackle topics below the visual surface of fashion. A great example of this is Fashion Revolution Podcast that addresses labour conditions in production locations and pushes for more transparency in the supply chain. In line with the medium, it gradually uncovers hidden stories and involves investigative reporting as well as interviews with observers, activists and decision-makers as well as those directly affected by the material production of fashion. It follows a similar approach to Behind the Thread , that explored issues such as sustainable cotton production and false labeling of source materials. Along the same lines but with a focus on brands and one-to-one interviews is Conscious Chatter , which showcases best-practice examples when it comes to fair and sustainable fashion production and asks about the motivations of the makers. Podcast format leads attention away from aesthetics and consumer desire towards silenced voices. Amplified without the necessity of shock-value often sought in news imagery, the urgency for change becomes clear and the listener is presented with long-term solutions instead of a call for short-term humanitarian relief. Hearing the voices directly without the distance created through writing, the public is addressed personally and hopefully becomes more engaged. 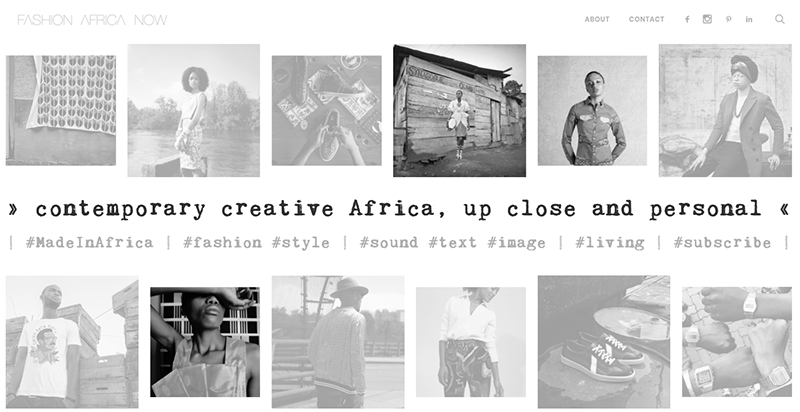 – Fashion Africa Now is a multidisciplinary creative platform that features practitioners from Africa and African diaspora. It is a platform created by APYA Productions, a Hamburg-based PR agency, that works to extend the reach of African creatives into European markets through media, shows, installations, exhibitions and film. Fashion Africa Now showcases their work and seeks to strengthen creative industries both locally and through international partnerships. 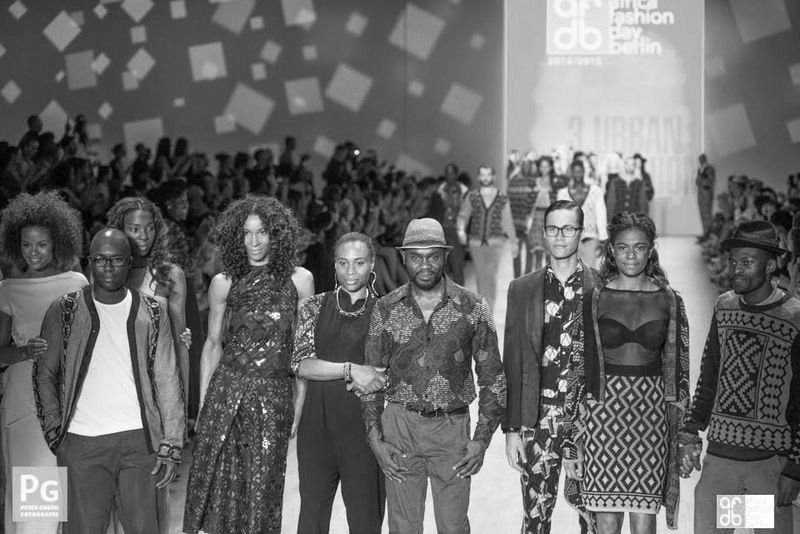 Having established Africa Fashion Day during Berlin fashion week, it succeeded in giving African labels a wider audience and reaching a new market. The aim of platforms such as Fashion Africa Now is to group people together to multiply visibility and international recognition. By becoming an established presence at traditional events such as fashion weeks, new groups challenge narrow views of what fashion can be, present non-Western perceptions of beauty and add much-needed creative diversity. This could be a step towards trading romanticized cultural appropriation for genuine cultural and creative exchange where all participants get an equal say. – Another podcast with a different focus is New York-based Unravel, founded by a group of former FIT students who seek to make fashion history more accessible to wider public. One-hour long episodes are recorded mainly in the form of interviews and roundtable discussions covering topics from cultural appropriation and body image to drag history and cosplay, with thoroughly researched background information and critical analysis. The show re-examines some overlooked aspects of fashion and fashion history such as Native American costume, pre-colonial styles and pregnancy attire. Guests include educators, historians, museum curators, artists and stylists who talk about their current books, exhibitions and research. 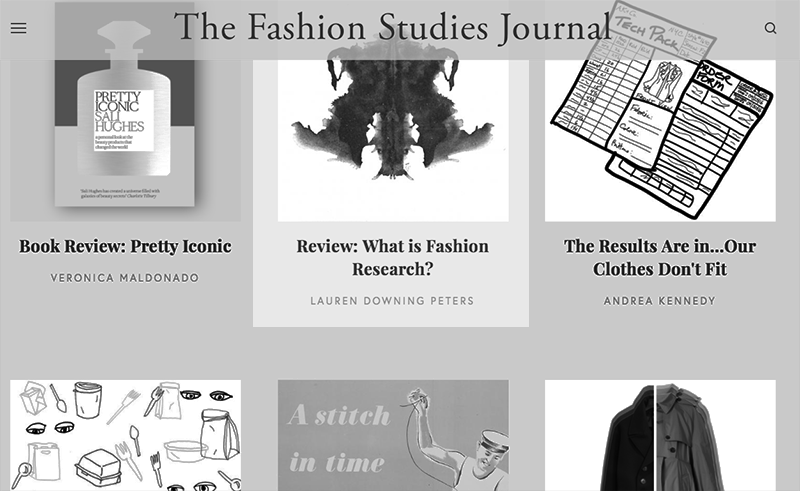 – Initially student-led, Fashion Studies Journal emerged in 2012 from Parsons School of Design’s MA Fashion Studies program as an academic online platform and testing ground for graduate-level writing. Since 2016, it widened its focus to become more accessible for readers beyond academia, covering contemporary fashion as well as fashion history and theory. Contributors range from emerging academics and journalists to established practitioners. They form a network that exchanges ideas beyond the online platform through workshops, dinners and book clubs. Instead of a blind peer review process, one-to-one reviews encourage dialogue and collaboration. As more Fashion Studies courses are on offer, online publishing platforms are being created by former students and many of the courses come with their own affiliated publications such as Marguerite by MA Fashion Cultures course based in London College of Fashion. Not only there to represent a cohort or a school, they serve as experimental spaces to test new approaches to fashion publishing and provide valuable feedback to emerging writers. Since they originate from small offline communities such as classrooms, their activities often extend into intimate gatherings that lead towards further collaborations. – The product of a collaboration between former Vestoj online editor Laura Gardner and graphic designer Karina Soraya, Mode and Mode is a fashion periodical that explores experimental publishing as a fashion practice. Each issue uses a different style and is centered around an interview about a print project. Previous issues shed light on the works of experimental fashion archivist Shahan Assadourian, designer Seth Shapiro and design collective BLESS. Mode and Mode is about print’s potential for critical reflection on fashion and widening its discourse. It discusses alternative projects while at the same time becoming an object of the discourse itself. – Model and activist Cameron Russell used her Instagram account to uncover hidden abuse in the modeling industry under the hashtag #myjobshouldnotincludeabuse. 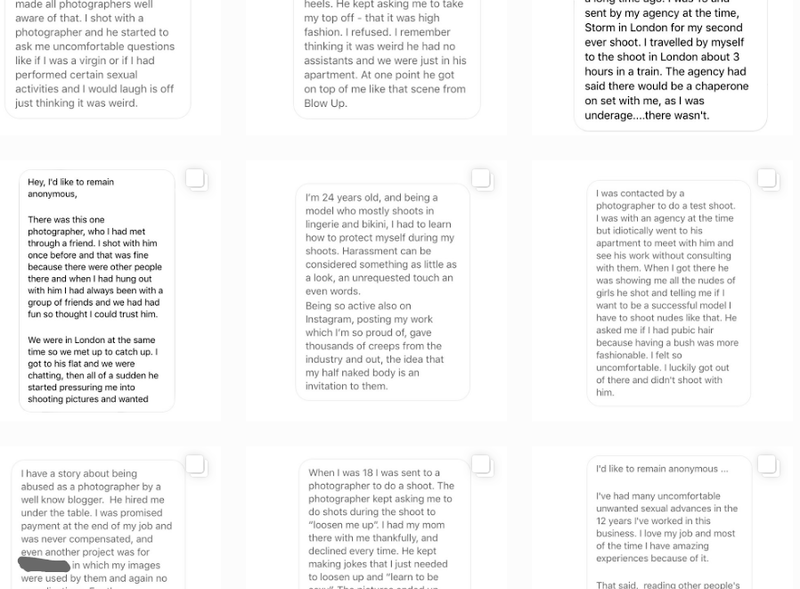 In light of the Harvey Weinstein revelations, Russell started to publish screenshots of messages by fellow models with personal stories of sexual assault in the workplace. Their identities remain anonymous, yet their stories appear similar and cause others to speak out as well, highlighting the vast extent of the issue and urging for more solidarity. Russell’s use of social media demonstrates how the tool can be used as an educational activist platform within existing channels. She combines information, first-person accounts and calls to action towards industry professionals with a discussion that reaches both those directly affected and those who were previously unaware. Alternative fashion media not only create new outlets but hack into existing ones where they can change the perceptions of those who consume products of immoral work practices. – States of Undress is a video docu-series launched in 2016 by Viceland, the TV channel of Vice Media. 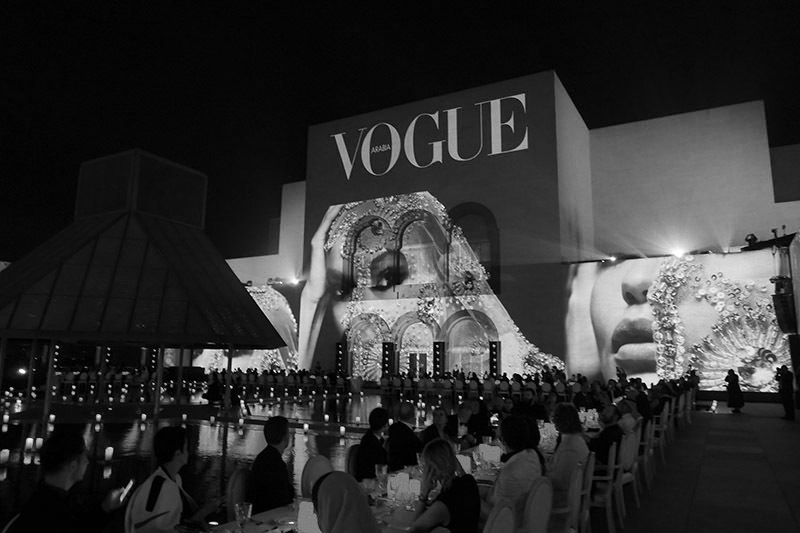 Trained journalist and model Hailey Gates visits different countries to report on the local fashion scenes, spanning government-supported fashion weeks, emerging designers, subcultures and couture. To give a more complete image, however, the series investigates the untold stories behind those events, uncovering complex situations such as a Hezbollah-supporting Lebanese designer working with a Syrian tailor who fled Assad’s regime or the extensive cosmetic surgery behind beauty contests in Venezuela that severely affect Venezuelan identity and self-worth. 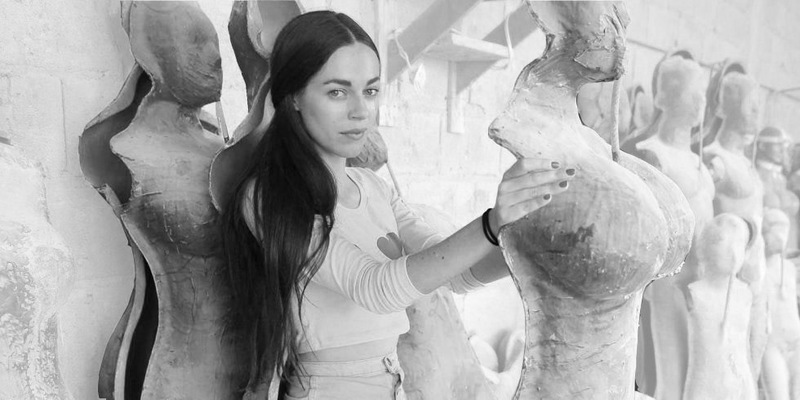 States of Undress doesn’t shy away from social and political issues and aims to make the complexity of the fashion system more understandable to a wider public. While the series started from a rather Americentric viewpoint with minimal understanding of other cultures, it gradually shifted its focus away from Western-influenced elites to to give more screen-time for those affected by the decisions of the former. Increasingly, a more balanced overview of multiple voices in each country was laid out and the presenter became more self-aware of her own complex position as a white, American, educated woman, which affords her many privileges while at the same time not protecting her from sexism and anti-American as well as anti-white sentiments.